The social media celebrity caused quite a stir after her controversial criticisms against new laws protecting Filipino domestic workers in Kuwait. And now, the Philippine Overseas Employment Administration (POEA) vows to blacklist Kuwaiti beauty blogger Sondos Al-Qattan after she questioned why should Filipino domestic workers have a day off every week and even keep their passports. Al-Qattan reasoned that domestic helpers should be able to work everyday and giving them their passport gives them a chance to run away. “The bilateral agreement and the guidelines issued by the POEA clearly state that the passport should be in the possession of (the domestic worker) and that she is entitled to a weekly day off. Kuwaiti employers who refuse to follow these provisions shall be immediately blacklisted,” POEA head Undersecretary Bernard Olalia said. POEA was prompted to blacklist Al-Qattan from the list of employers after Blas Ople Policy Center headed by Susan Ople brought to their attention the video of the beauty blogger declaring disagreement with the new policies for domestic helpers. 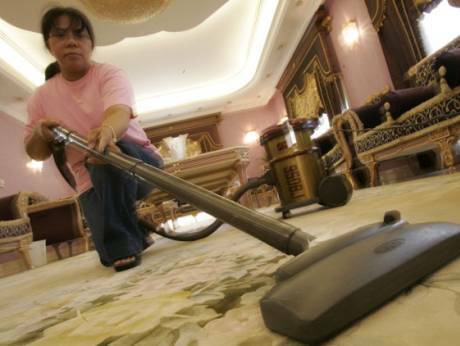 Al-Qattan’s statements had even prompted her fellow Arabs, such as Khalid Al Ameri, to react against her, saying that she is not fit to employ domestic workers. He retorted his own countrywoman on grounds of giving protecting the rights of domestic workers in Kuwait. He heartily regarded the need for domestic helpers to have a day off like any other worker so that they may rest, recover, and ready themselves for another working week. “By her words, publicly uttered through social media, her undesirability as a foreign employer cannot be denied. She is not worthy to be even in the same room as our valiant and hardworking OFWs (overseas Filipino workers),” Ople said. The Policy Center urged other labor-exporting countries to blacklist Al-Qattan. POEA reported that they keep close monitoring over the implementation of guidelines in the deployment of domestic workers in Kuwait to ensure that their rights are protected and respected.